What Was in the Kettle? Before I left for work yesterday, I filled up the crock-pot to make my favorite beef stew. I love the convenience of filling up the pot, turning it on and when you get home dinner is ready. But this story isn’t about cooking. It’s about birds! Last night after a nice dinner of Wild Mushroom Beef Stew, we ventured outside to work in the yard. Charlie was spreading mulch, I wanted to do some more bird photography and Nina was happy to explore the yard or hang in the shade as usual. When we first stepped out the door a couple of hawks cruised low over the house just above the tree tops. Since I was already geared up with binoculars on, I took a quick look to see if I could identify what kind of hawk they were. We determined that one of them was a Northern Harrier, but it was what I saw flying higher in the sky above the harrier that really caught my eye. A large kettle of mostly broad-winged hawks were migrating through our area. They were so high that you could only see them with binoculars. Migrating hawks conserve energy by circling high in a thermal updraft and then gliding down toward their destination. As a group of hawks catches a thermal other hawks migrating through the area see them and join the group. When they reach the top they start to glide on their way to find another updraft. At one point the kettle I saw had about 100 birds in it. Most of them were broad-winged hawks, but I am sure there were a few other species mixed in. They were so high I could not make a definitive id on all of them nor could I manage to photograph them. A fellow birder, Jim Pisello, photographed a small kettle recently (check out the link for a picture) while watching the Rochester, NY peregrine falcons downtown. There are many exciting things to see with all the birds we have around. All you have to do is keep your eyes to the sky, and it wouldn’t hurt to get a good set of binoculars, either. I think I have started something big! I spent part of today desperately trying to locate live mealworms to purchase before I got home. I did not want to have to endure the wrath of the bluebirds and their cohorts if I came home empty handed today. Before picking Charlie up from work I had to stop at a local pet store to refresh my supply of live mealworms for the bluebirds. I found one pet store in our area that sells mealworms in bulk. The branch closest to where I work sold out their shipment from yesterday in less than 24 hours! I called the other branch that is just down the road from Charlie’s work and luckily they had enough for another quarter pound. I was desperate, so I left work a little early, and picked up the mealworms. Earlier in the day I placed an order for 5000 of these tasty creatures that will be shipped from Crazy Carl’s Worm Farm in Concord, NH. This is the first time I have ordered mealworms through the mail (not a big surprise since I only started using them last week) so I hope they are as good or better than advertised. I was hoping that they could make it here by Saturday, but I guess we are just a bit too far away to make it in 2 days so instead they won’t be here until next Wednesday. 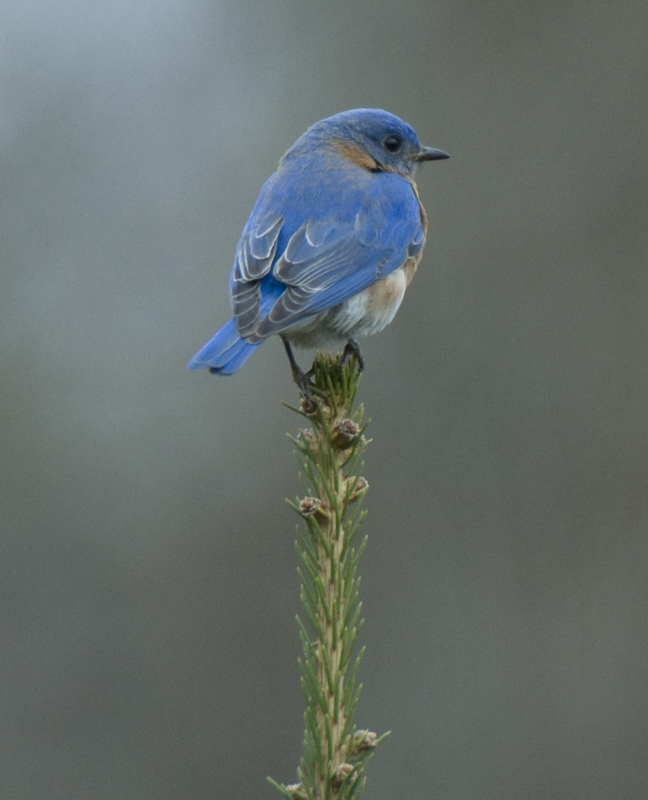 Lucky for me I discovered last night that the bluebirds and their feathered friends aren’t as picky as I thought. I originally picked up some dried mealworms at The Bird House, a local bird supply store, but was worried that the birds would not like them so I started with the live ones. Last night I added some of the dried ones with the remaining live worms and the birds ate them too. That was great news. I will add a few of the dried ones to each feeding I put out to stretch my supply until the shipment arrives from Crazy Carl’s. Charlie thinks I am the crazy one for ordering 5000 of these little babies. I say they will go faster than he thinks! The first order of business upon arriving home every day is to take Nina out and then feed her. After that I filled up the platform feeders with the new mealworms. I have been calling to the bluebirds when I fill the feeders so they will get used to coming when the feeders are freshly filled. My goal is to have them eat first and then the other birds can have their fill. As soon as I was in the house I put up the window shades and saw that both bluebirds were on the feeder noshing away! Looks like I already have them trained to recognize when I come outside and fill the feeders, or is it that they have trained me to go out of my way and make sure there is a daily supply of fresh mealworms available for them? It can only get worse when they start feeding their babies that I hope they produce. I may have to buy another refrigerator just to store all the mealworms. If you build it they will come…and hopefully stay! 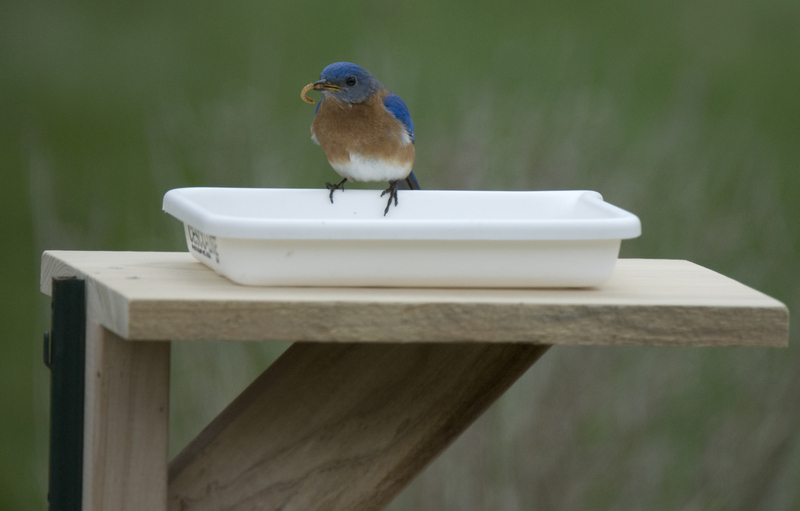 A few weeks ago my husband, Charlie, built a couple of Gilwood Bluebird nest boxes and we put them up on our property. Within a few days we spotted a bluebird couple checking out one of them and within days it appeared they had settled on the box in the back yard. We wanted to make sure they would stay so we hatched a plan to create a tray feeder so we could offer them some live mealworms. I purchased the wood needed and Charlie came up with the design using a plastic tray he found at work. In one night he had them cut and put together. It took me a couple of days to locate live mealworms for sale in Rochester. Apparently they sell out quickly after each weekly delivery! I also purchased an official Bluebird feeder (one that is built like a house with plexiglass sides and an entrance hole) that is supposed to deter larger birds from getting all the mealworms. Unfortunately the bluebirds (or any of the other birds around) couldn’t seem to find the hole. 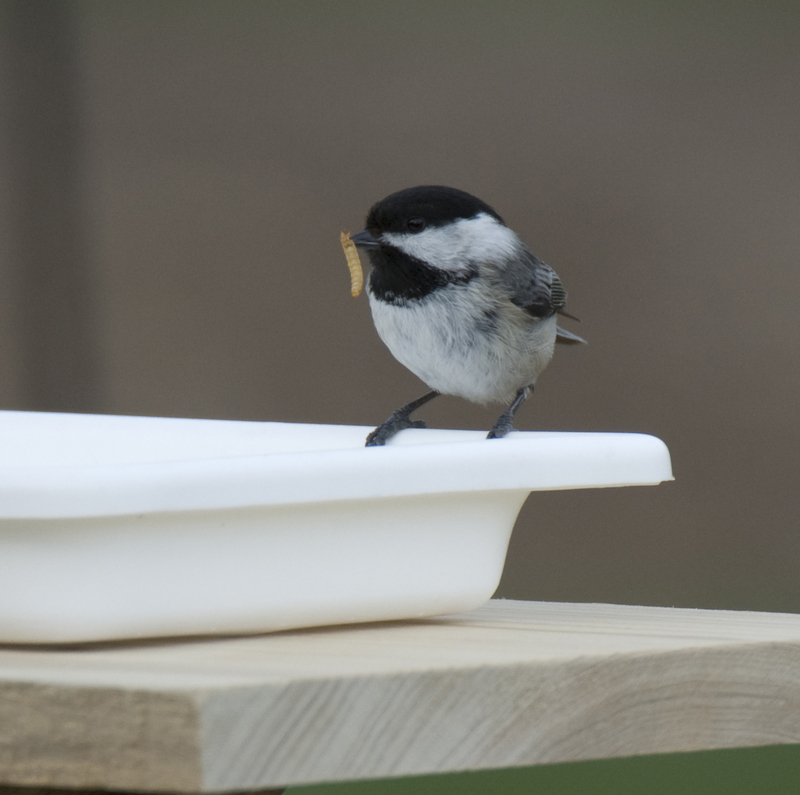 The tray feeders that Charlie built were quickly a hit. The first to explore the new feeder were the Chickadees, of course. They are always the first to explore anything new in the yard that might contain food. Then the Tufted titmice saw what the Chickadees had discovered and decided to get in on the action. Finally, after a day of feeding the Chickadees and Tufted Titmice, the Bluebirds took notice. 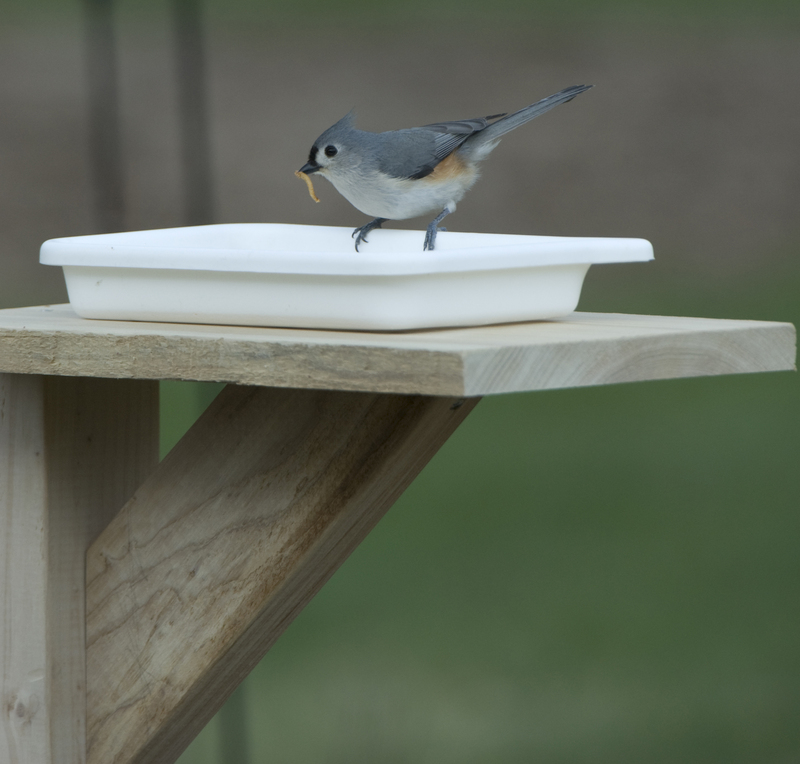 We placed two tray feeders in the back yard about 20 – 30 yards from the nest box they were frequenting. The hope is that they will enjoy their meals every day and decide to make the nest box their home for the summer. So far they have been hanging around the nest box and venturing inside to check it out, but I haven’t seen them bringing in nesting material yet. 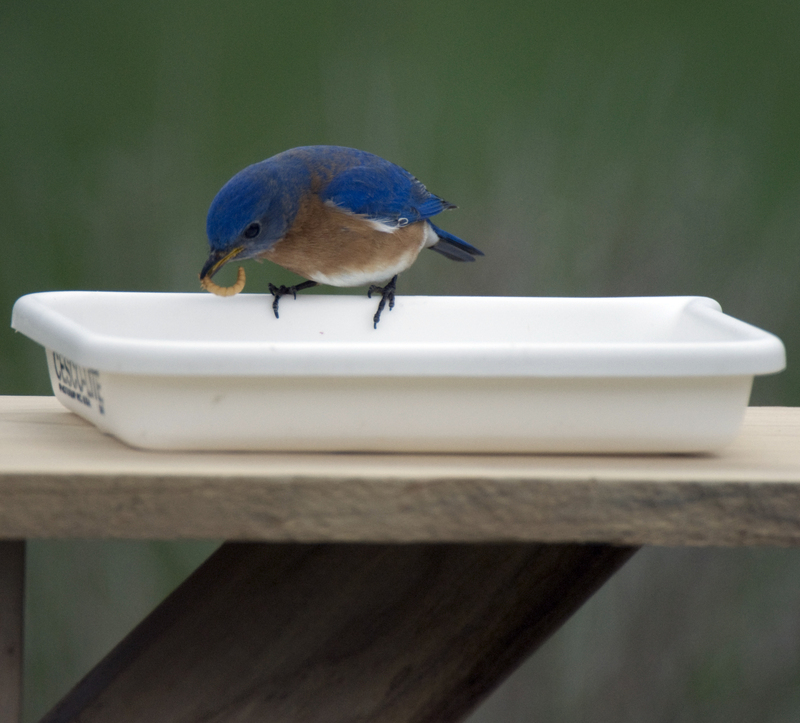 A Bluebird finally checks out what's for dinner! I hope we have enticed the Bluebirds to stay around for the summer. Today I took the day off and spent all morning watching the bluebirds and all the other feathered visitors to our backyard feeders. We have numerous perches for everyone to hang out on. The bluebirds are particularly fond of a spruce tree that overlooks the meadow where the nestbox is and also has a clear view of the feeders. Here’s hoping there will be many more blog posts about our families of chickadees, titmice, and bluebirds to name a few for the coming season!